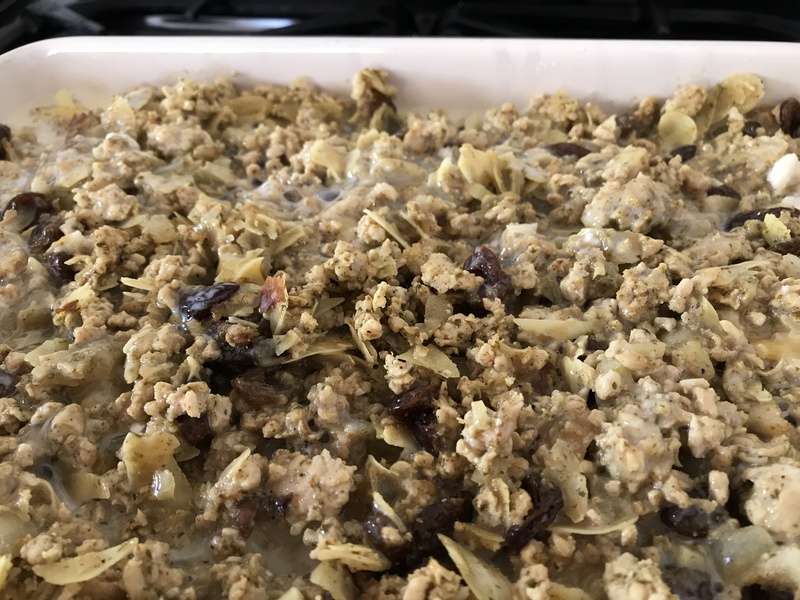 I had my first taste of Turkey Bobotie nearly 40 years ago when a friend cooked it for me one evening. It was absolutely delicious and I have been cooking it ever since. 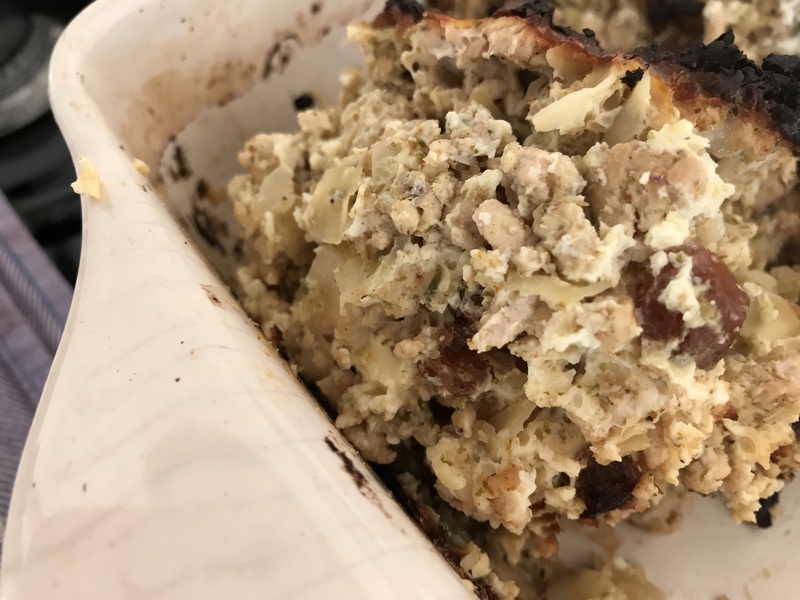 I have no idea where my friend got the recipe from but searching on Google I find that Bobotie is a South African dish consisting of spiced minced meat (often beef or pork) baked with an egg-based topping. Because Bobotie reheats beautifully (covered in foil) I always make a large one but the recipe could easily be halved. 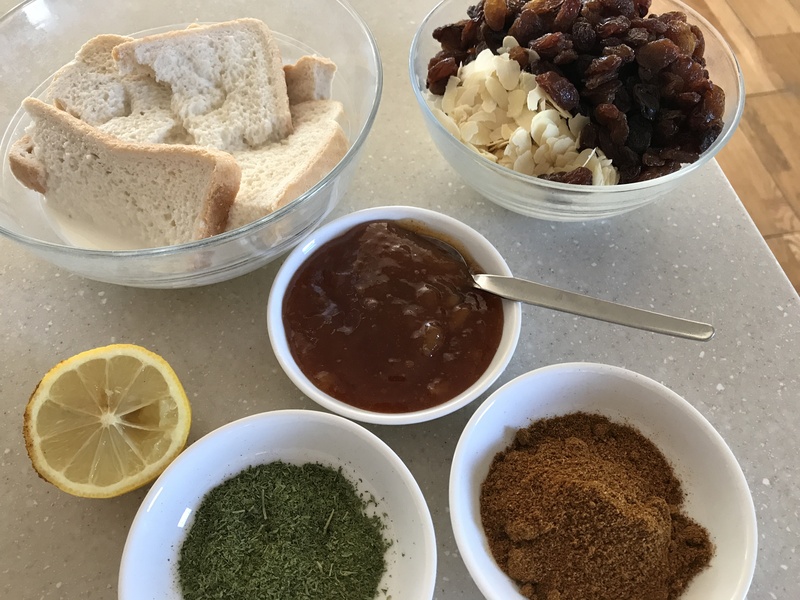 I often use gluten-free bread as my husband is gluten intolerant but have used sourdough and ordinary bread in the past; the bread keeping the Bobotie lovely and moist. More topping can easily be added by the addition of another egg and a little more milk. This is a lightly spiced dish, full of delicious sweet and spicy flavours. I usually use a hot curry powder and it isn’t overpowering. Place the bread in a small bowl and pour over the milk. Gently saute the garlic and onion in the oil for 5 minutes. Add the turkey mince and fry until slightly browned and cooked through breaking up the turkey as it cooks. Stir in the curry powder, almonds, sultanas, parsley, lemon juice, chutney and seasonings. Squeeze the milk out of the bread (retaining the milk in the bowl) and add the bread to the turkey mixture, stirring it in thoroughly. Spoon the mince into an oiled ovenproof dish. Beat the eggs with the milk and pour over the mince. BAKE: 350°F Gas 4 for approximately 40 minutes or until the egg mixture has set and the turkey piping hot. Serve the Bobotie with “yellow rice” and slices of banana, or a fresh green salad. This entry was posted in Dinner, Supper and tagged Almonds, Curry, Dinner, Gluten Free, Healthy Eating, Sultanas, Supper, Turkey. Bookmark the permalink.